The office of the Public Protector, Busisiwe Mkhwebane, has confirmed that she has laid criminal charges against State Security Minister Dipuo Letsatsi-Duba at the Brooklyn Police Station in Pretoria. The charges relate to Minister Letsatsi Duba’s alleged failure to furnish the Public Protector with declassified document she requires in connection with an investigation into alleged violation of the Executive Ethics Code by former Minister of Finance and now Minister of Public Enterprises, Pravin Gordhan. Mkhwebane says she views this as an interference with the functioning of her office. “The law is very clear; the Public Protector has the power to direct any person to produce any document which has a bearing on a matter under investigation. A person who, without just cause, fails or refuses to comply with this, is guilty of an offence and if convicted, such a person may be liable to a fine not exceeding R40 000 or imprisonment not exceeding 12 months or both. The Constitution also prohibits interference with the functioning of the PP (Public Protector),” says Acting Spokesperson for the office of the Public Protector, Oupa Segalwe. 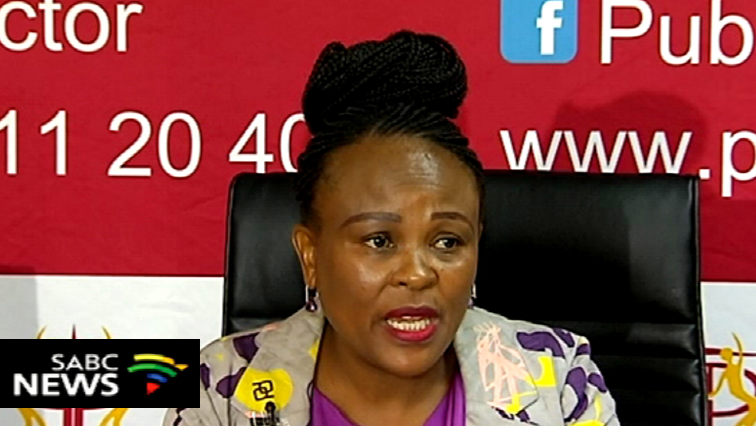 The post Public Protector lays charges against State Security Minister appeared first on SABC News – Breaking news, special reports, world, business, sport coverage of all South African current events. Africa's news leader..